SAKHI fidgeted nervously on the matted clinic floor, twisting his scarf in his hands. "I am desperate for some heroin," he said. "The urge is so strong it is hard to fight." Unlike most other addicts here, the former opposition fighter did not take heroin of his own free will. "The Taleban gave it to me to make me fight against my friends, their enemies," he said. "Now I am humiliated, I am locked in this clinic and it is all because of the Taleban." Sakhi was fighting for the Northern Alliance when he was captured by the Taleban forces and taken to prison in Jalalabad. For Sakhi, a proud fighter, nicknamed Commander Crazy by his comrades, the confines of an enemy prison were hard to bear. Already an habitual marijuana smoker, he begged his captors for supplies of the drug to ease the harshness of prison life. The guards refused and packed him off to the front line, promising that the Taleban commanders there would give him what he wanted. The marijuana they gave him was unlike anything he had tried before. "When I smoked the hashish, it felt different in my body." he said. "It made me feel powerful and fearless." Only later did Sakhi learn that the commanders had mixed heroin powder into his marijuana to spur him into fighting against his own army. By then he was addicted. After smoking his daily dose of heroin he barely hesitated when asked to fight against his former friends in the Northern Alliance. "I felt the urge to kill even my comrades. I would do anything they wanted just for the drugs." None of the Taleban took heroin but it was fed liberally to the opposition captives. Their addiction proved more effective than any prison bars. "I could have escaped and tried to make it back to the Northern Alliance, but I knew I wouldn’t be able to get heroin there. So I was forced to stay with the Taleban," he said. It was not hard for the Taleban to keep supplying Sakhi’s habit. For years, the regime has been heavily involved in the trafficking of more than 80 per cent of the world’s heroin. Taxes on opium crops provided much of the cash needed to buy weapons for their fight to control the whole of the country. Production supposedly ground to a halt last year when the Taleban leader ordered an end to poppy cultivation on religious grounds. But insiders say the trade goes on and supplies are plentiful. "We stopped growing it when Mullah (Muhammad) Omar told us to but we had already 400kg of opium in our stockpiles," said Abdul Ahmed, 28, a farmer from Helmand. He came here three weeks ago to overcome the addiction he developed at the age of ten when he sucked the juices from a poppy plant growing on his father’s farm. Since the ban, opium growers like him have been slowly releasing their stocks on to the market, keeping prices buoyant. But last month the Taleban rescinded the ban on production, paving the way for a new opium crop to be planted. Political uncertainty in the wake of the terrorist attacks in America has also brought a flood of cheap heroin on to the market as farmers offload their stocks in exchange for ready cash. Dealers in Quetta say prices here have halved in the past two weeks, from 50,000 rupees (£570) a kilo to less than 25,000. Beneath the bridge over a stinking sewer where Quetta’s heroin addicts gather, a day’s supply can now be bought for less than 50p. Those involved in the trade say it will not be long before the flood of cheap heroin reaches Europe, sending prices plummeting worldwide. The Taleban have been happy to reap profit from the international trade in heroin but there are harsh punishments for Afghans caught using it without their permission. After being discharged from the Taleban army on the grounds that he was no longer fit to fight, Sakhi was forced to undertake a dangerous daily pilgrimage to remote areas close to Pakistan to buy heroin away from prying eyes. "My friend Hassan was caught bringing opium back from the border," he said. "They cut off four of his fingers then painted his face black and paraded him around town on the back of a donkey as a lesson to others." Horrified by their son’s fate, Hassan’s parents took pity on Sakhi and gave him the money to come to the clinic in Quetta. Seven days into his treatment, he is determined to kick his habit and is already vowing revenge on the commanders who landed him here. "I wish I had the manpower, 40 or 50 people, so we would go and fight the Taleban," he said, glancing around at the stupefied patients. "I want to kill them all for what they have done to me." Mr Ahmed is also planning his return to Afghanistan, not to fight, but to plant his fields with opium poppies to replace the stunted wheat crops he had grown in their place. Despite the suffering caused by his addiction, he sees no shame in making his living from the misery of others. "We have a tradition in Islam that if you are starving you can eat the meat of animals that is forbidden at other times," he said. 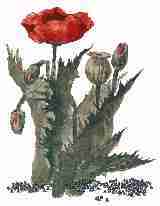 "It is the same with the opium poppies. We are compelled to grow them because we are poor."